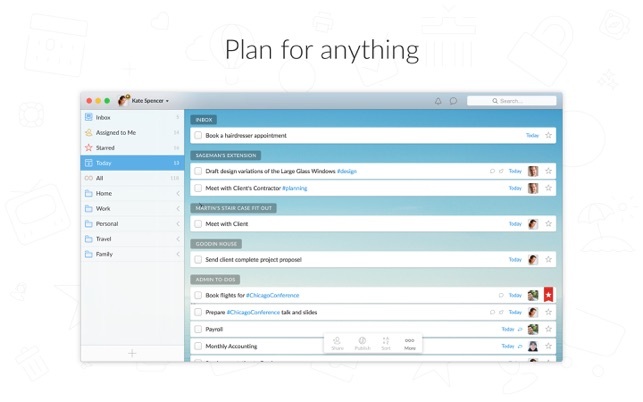 Wunderlist is a simple to­do list and task manager app that helps you get stuff done. Whether you’re sharing a grocery list with a loved one, working on a project, or planning a vacation, Wunderlist makes it easy to capture, share, and complete your to­dos. 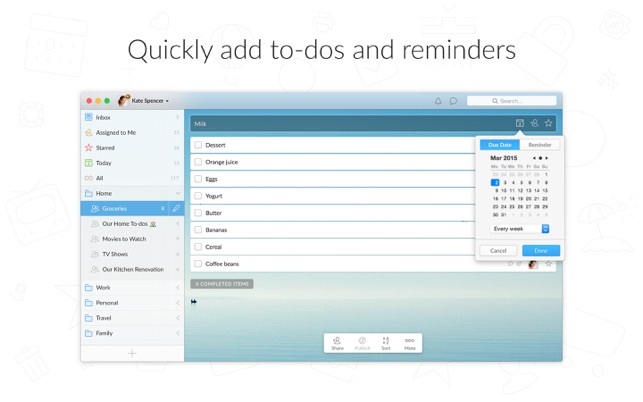 Wunderlist instantly syncs between your phone, tablet and computer, so you can access all your tasks from anywhere. 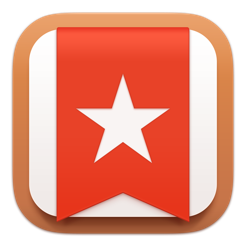 Wunderlist has also been featured in The New York Times, Lifehacker, Forbes, The Guardian, Wired, and Vanity Fair, just to name a few. Fixed: We fixed a number of crashes that might have been getting in the way of you being productive. We’re sorry about that. Fixed: If you like to move straight from your desktop to your phone then you’ll be pleased to hear that we fixed our Handoff support bug. 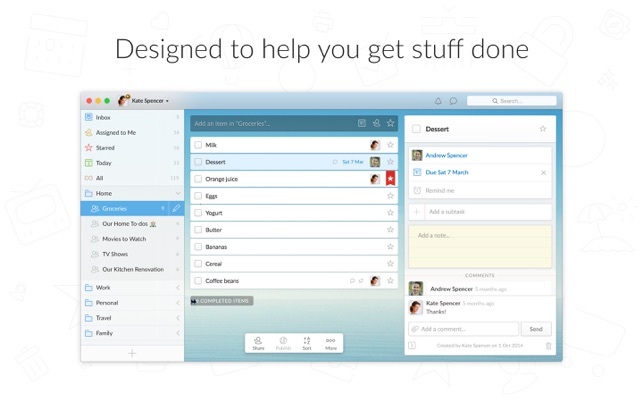 Now Wunderlist will open on your iPhone exactly where you left off on your Mac when you use Handoff. If I had to pick three apps that I couldn’t live without.. or software that is tremendously useful in the modern age.. well, let’s see google maps, tax software, and WUNDERLIST.. No kidding. It’s that good. 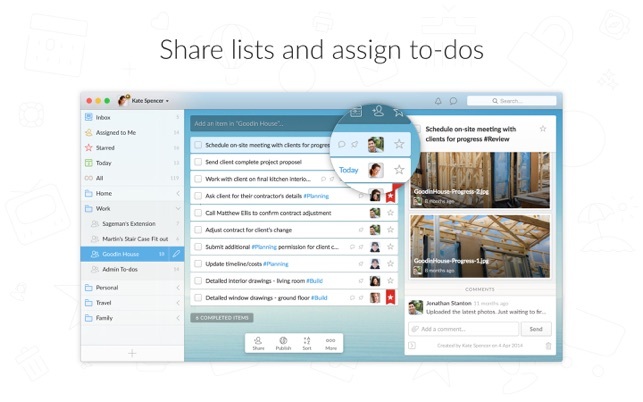 Easy to use, cross platform, powerful sharing tools, you have no idea how many organized lists I have in this thing. I use a couple of general sort lists for work and for personal tasks, but then have lists on & with individual family members, vehicles I own, specialty shopping lists, financial project lists, house project lists, you name it. I have nearly 20 folders of lists, with multiple lists nested. For instance, a Family folder with one list for each family member and shared projects, one Folder on Vehicles, includes lists of maintenance and also historical pieces on every vehicle. Want to know when I replaced tires, (or what size and brand), want to know when exactly I replaced batteries on smoke detectors or the house water filters, or what all my hotel, airline mileage plan numbers are.. That’s not even counting Folders and Lists for work programs and projects.. It’s amazing. The real trick for me is the note feature in each list. I keep all sorts of data inside the individual lists under ‘add a note.’ I also label some items with a name and (routine) in the title - when I complete those I throw them in another list and recycle them whenever needed. The app truly works Wonders. Love this thing. A friend told me about this app. It has simplified my life times 1,000. I had notepads everywhere with lists of To Do’s for business, personal, around the house, shopping, etc. So many pieces of papers and notepads I was frustrated I could not somehow organize them so I could keep up and not feel overwhelmed with everything I had to do. I could not keep up with anything. Now it is all in one place and alplabetized so it is easy to locate. I can put a reminder and due dates on each item so I get a reminder to do it as it needs to be done. I can delete it once it is completed without having pages of notepads with items marked through but needing to keep the page with other items that need to be done. I can share lists with family members so they can add items to a Wishlist for Christmas or for items needed at the grocery store. Which by the way is the easiest way to have a grocery shopping list because you add items as you think of them and it is shared so whoever does the shopping always has a current list. I have the app on my laptop and my phone. The lists always sync on both so always have it available no matter which one I use. Absolutely the best thing that has happened to me to simplify my life. I owe my friend and will be taking her out to one of the nicest restaurants in Dallas as a thank you for how she has helped me get my sanity back! Thanks Rebecca you are a saint. but it could be just a little bit better. My only issue is with the lack of flexibility for recurring tasks. 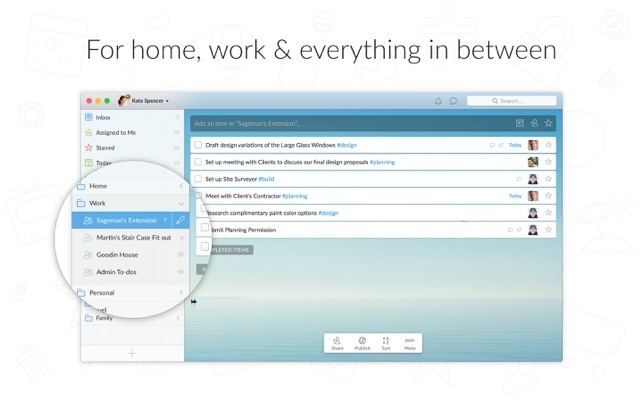 One reviewer mentioned have the ability to set a recurring task only for weekdays. That would be helpful. But my biggest issue is that you cannot set the tasks to repeat on completion of the task. This can be annoying with daily tasks that don't all get complete every day. They pop up as overdue, which is fine, but then when you check them off, they pop up again for the same day. It is actually worse for things that are repeated less often - I.e. the task of watering plants. If I set that to repeat once a week but don't get it done on that day but a couple of days later, when I check it off, it brings it back up 5 days later. If I don't remember to change the due date, my plants may get too much water. The reason I use apps such as these is because my memory is not the best. I need help with that. The plants are not so important, but lack of that option makes the app less useful. It would also be nice - though not critical- to have the option to repeat things with other criteria, like on the first Monday of each month, etc. Otherwise, I am happy with the app. Could be happier. I would not even mind paying a few dollars for the added flexibility.